Thugle services private limited is an ecommerce platform that sells mobile phones and accessories. The company is a one stop shop for all the requirements associated with mobile phones. It strives to sell out the products at competitive and cheaper price than giants in the industry. The online shop embraces phones and accessories of all the big brands and also the brands that are performing really well in the industry. 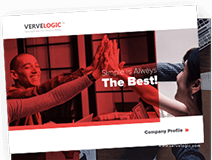 Work done by team verve logic is amazing and i am very much impressed like before i have tried other service providers for the same as a last try i thought of going with verve logic and they have given me amazing logo for the company. They understand the client needs and also what they are looking for and they just don't work exactly with your idea but much more than that putting their ideas too making it more good. The work given by verve logic made me not to think other than verve logic. When i think about other logo design my destination would be verve logic. Thank you so much for giving me such an amazing logo. If you Need a Logo or Branding Material, Connect with Us!! !